There was an interesting programme on BBC2 last night called The Battle for Stonehenge. It was a a Culture Show Special looking at the recent history of England's most famous stone circle. 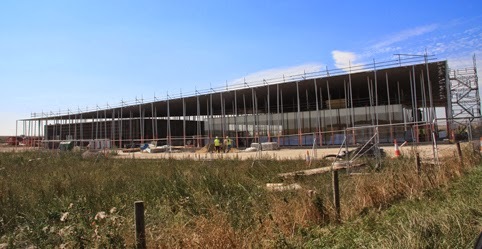 Arts presenter Alastair Sooke reported on the changes to Stonehenge over the past year - including the building of the new visitor centre (pictured above) and the arguments over whether it is appropriate to display ancient skeletons there. The programme also covered the infamous Battle of the Beanfield in 1985 in which police used extremely heavy-handed methods to stop the Peace Convoy getting to the stones for a free festival at the Summer Solstice. Alastair also talked to Druids and attended their rites at the stones, as well as interviewing Simon Thurley, head of English Heritage, which manages the ancient site. I thought it was a well-balanced, informative and interesting look at Stonehenge. The programme was on BBC2 at 8pm on Saturday 21 June, but should still be available to watch on BBC iPlayer for a week or so. The photo at the top shows the new Stonehenge visitor centre being built. I took the photo last autumn.